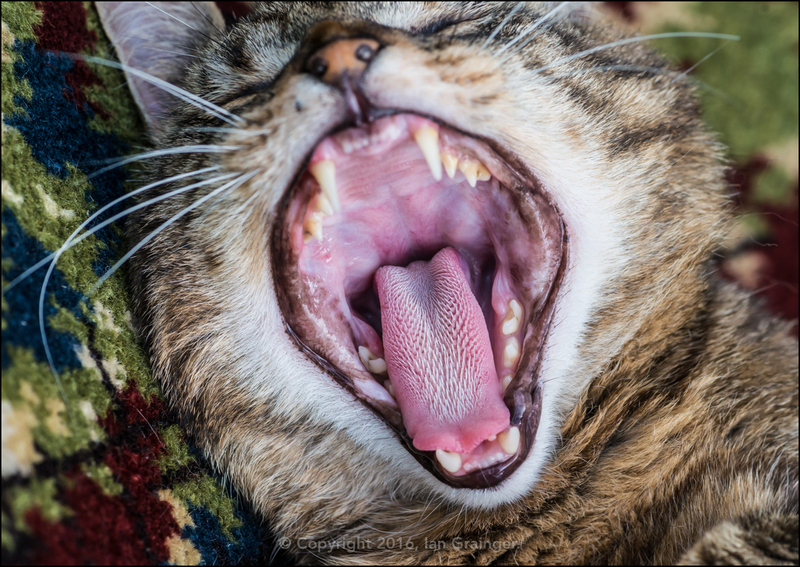 It was only a matter of time before my photographic buddy became one of this year's Image of the Week subjects, and I think you'll agree that my little friend deserves his time in the limelight. I'm not sure what he gets up to in his busy evening schedule, but he's taken to napping during almost every daylight hour. 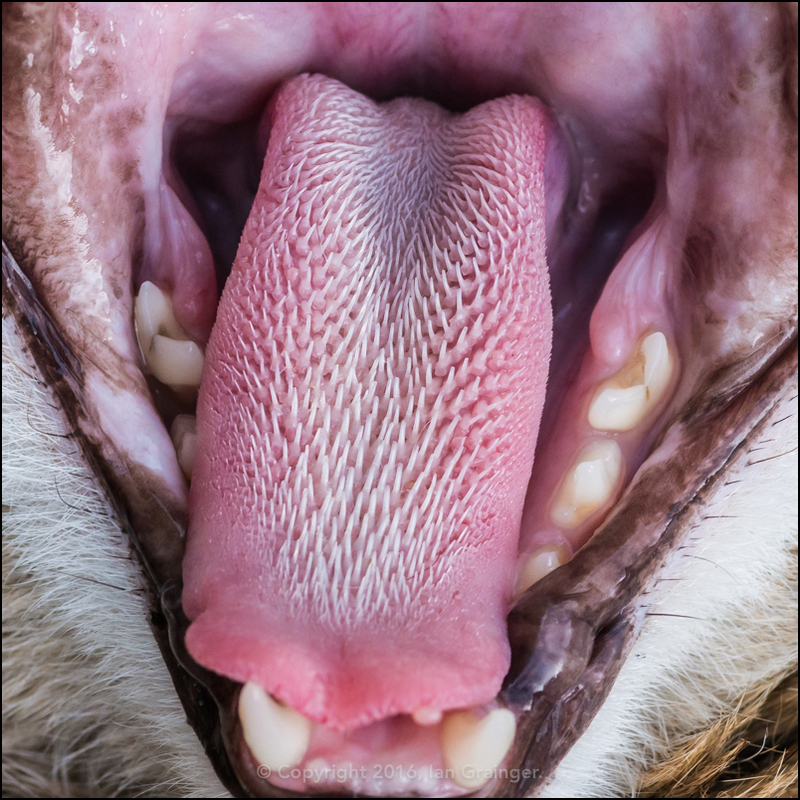 While I realised that cats had quite a rasp for a tongue, I hadn't realised quite how textured it was until I zoomed in on the shot above. I mean, look at it! No wonder cats suffer from fur balls!!! 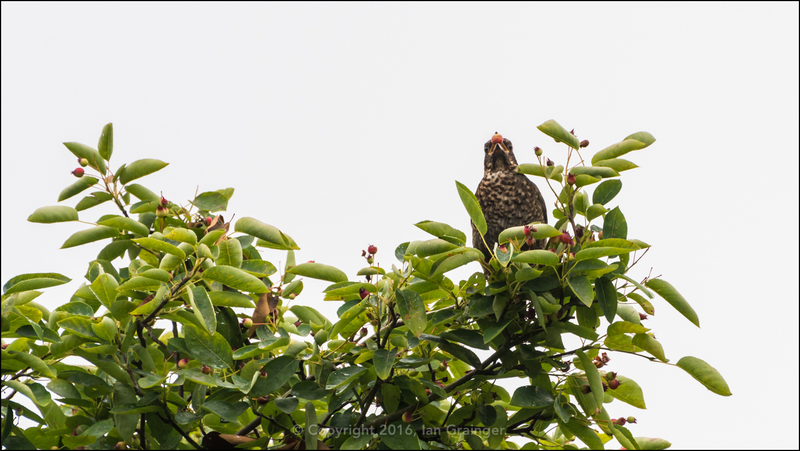 As you can tell from the grey sky, it wasn't the nicest of days when I went on my main photo shoot this week, but this Song Thrush (Turdus philomelos) didn't seem to mind as it snaffled berries from the Amelanchier tree. 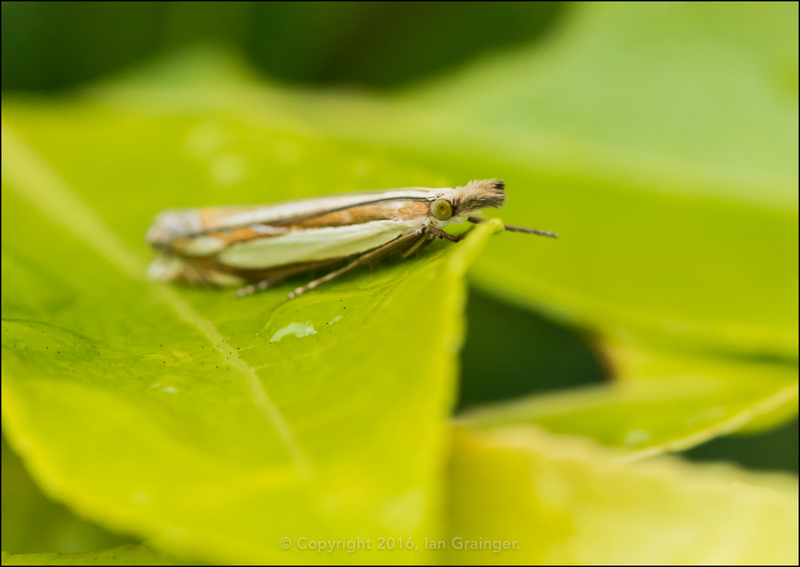 This Crambus species of Moth was flitting about the hedgerows in broad daylight. I'm not sure if it's a natural nighttime flyer, and I or something else had disturbed it, but it seemed quite happy going from leaf to leaf. 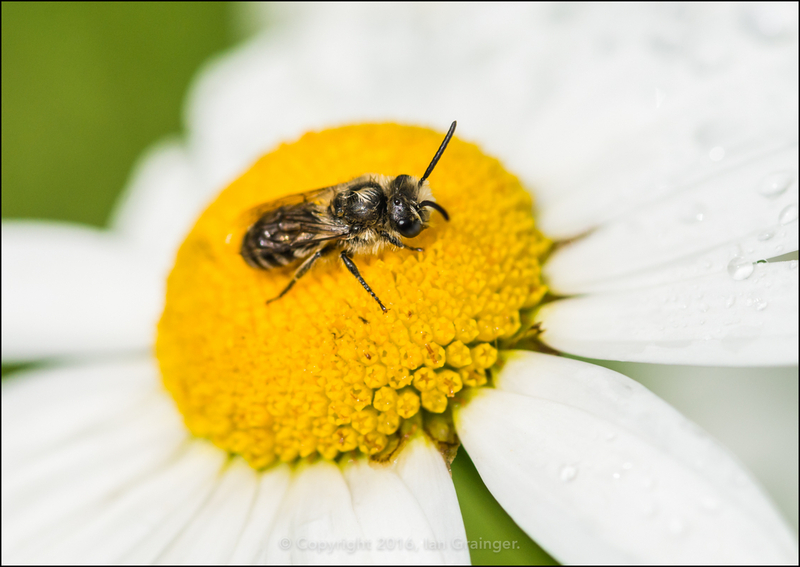 ...although there were some small Bees out in force. 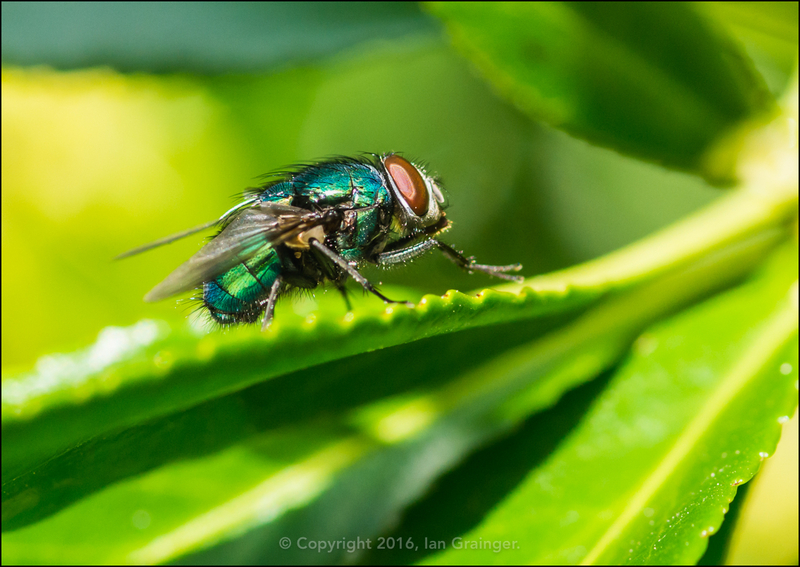 The Greenbottle Flies (Lucilia caesar) were also aplenty, trying to warm up in the hedgerows. 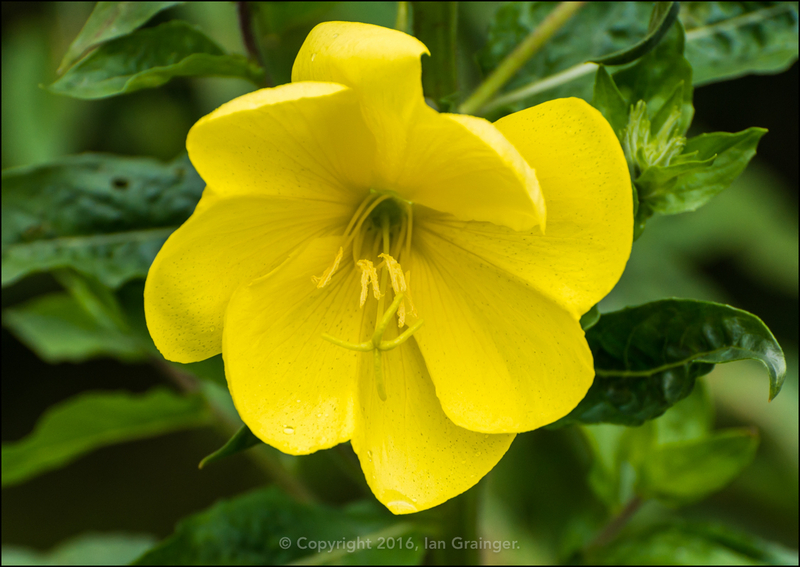 New flowers for this week included these beautiful Evening Primroses (Oenothera), which get their name because their petals open up wide every evening as dusk arrives. 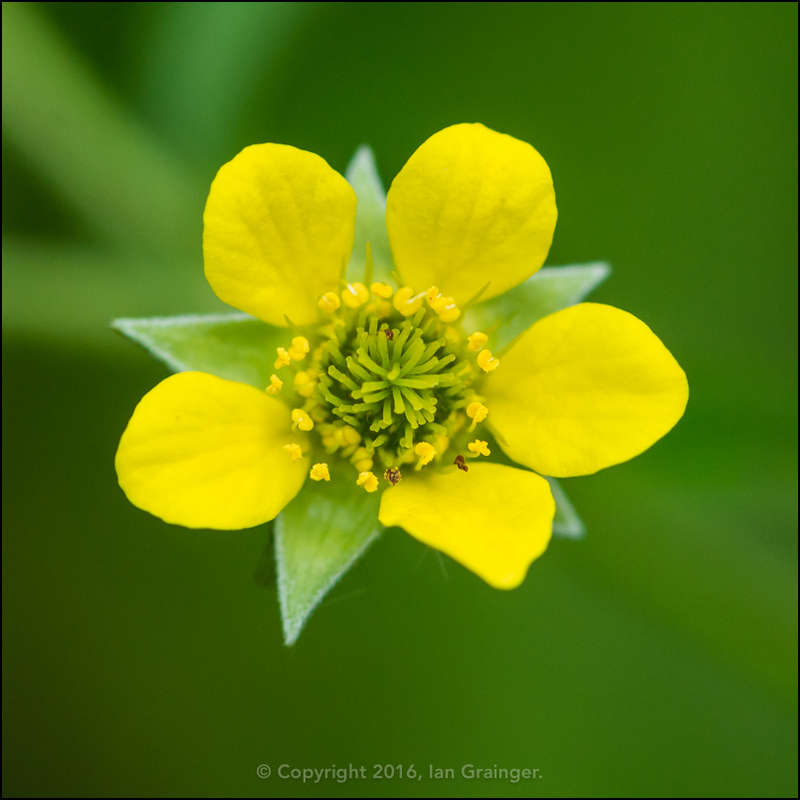 Another UK native plant that the insects love are these little Wood Avens (Geum urbanum). 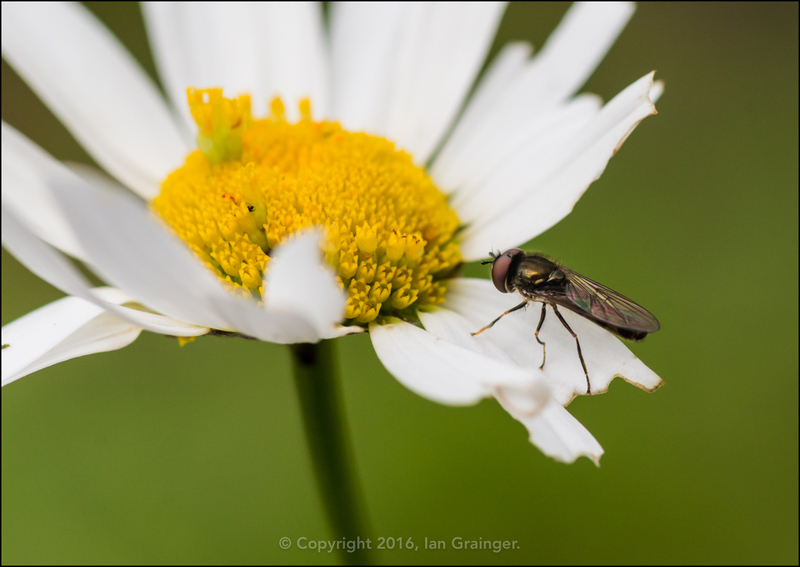 They're another plant that most gardeners weed out, but I like to leave them for the insects. 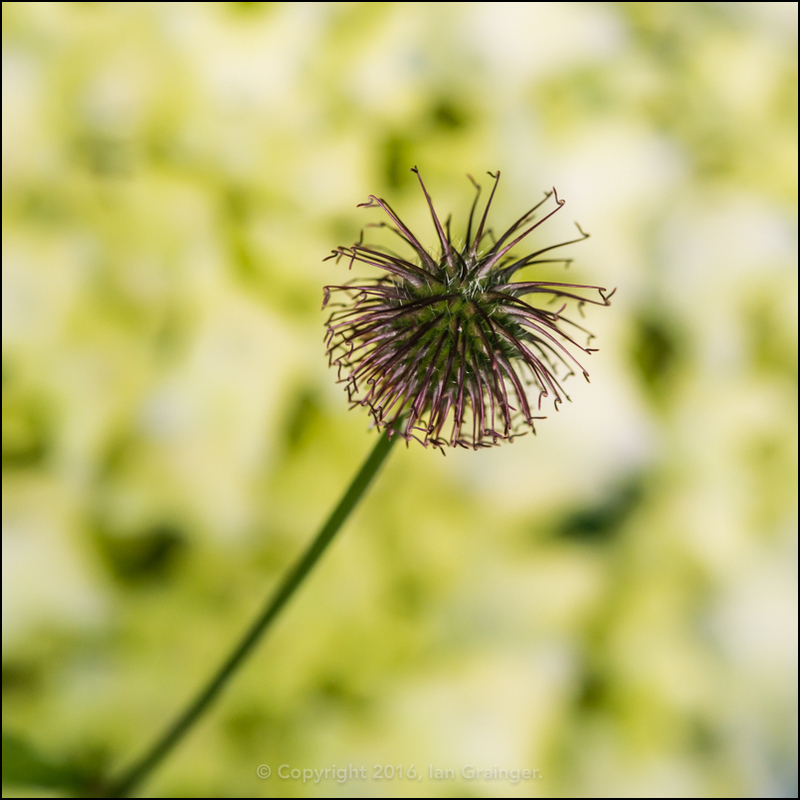 They also look quite pretty when they set to seed. 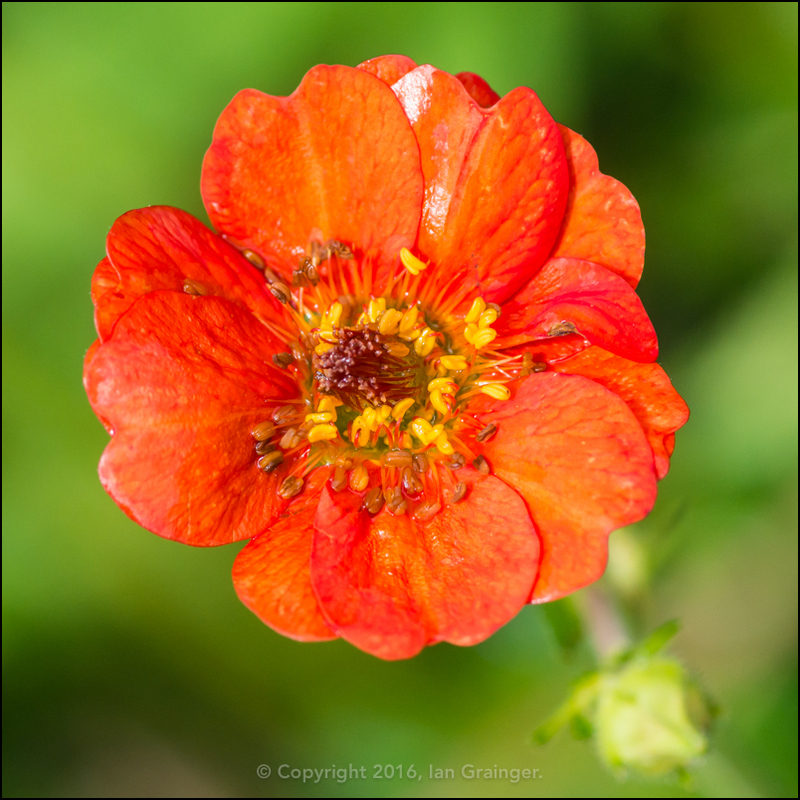 And at the end of the day, they're a free form of the larger and more colourful Geum's you can purchase from the garden centre. 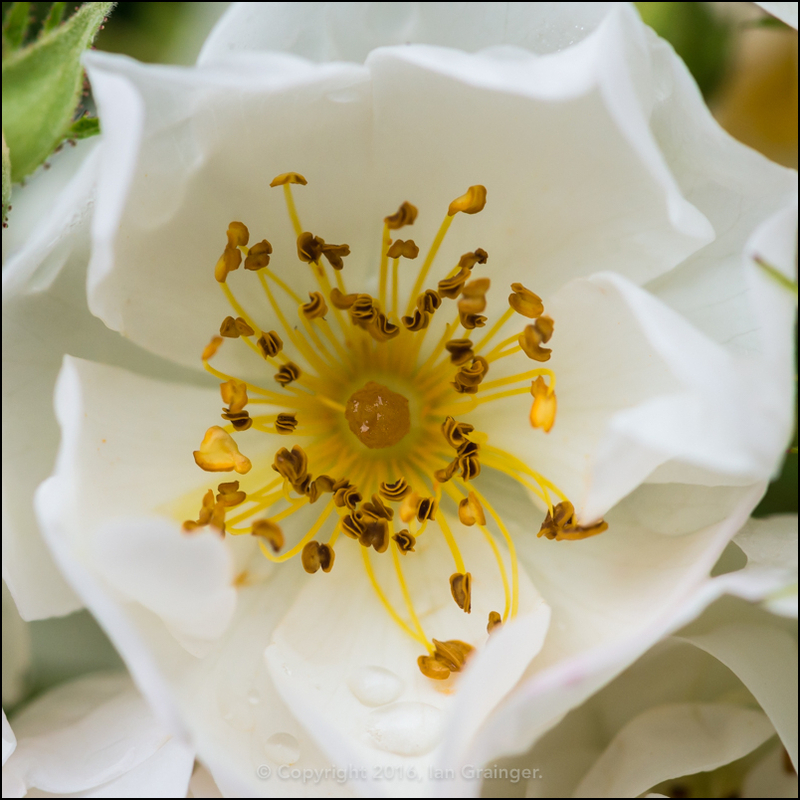 At this time of year the Wild Roses are starting to run rampant, and this one is climbing through Virginia Creeper that my dad has growing up a wall in his garden. 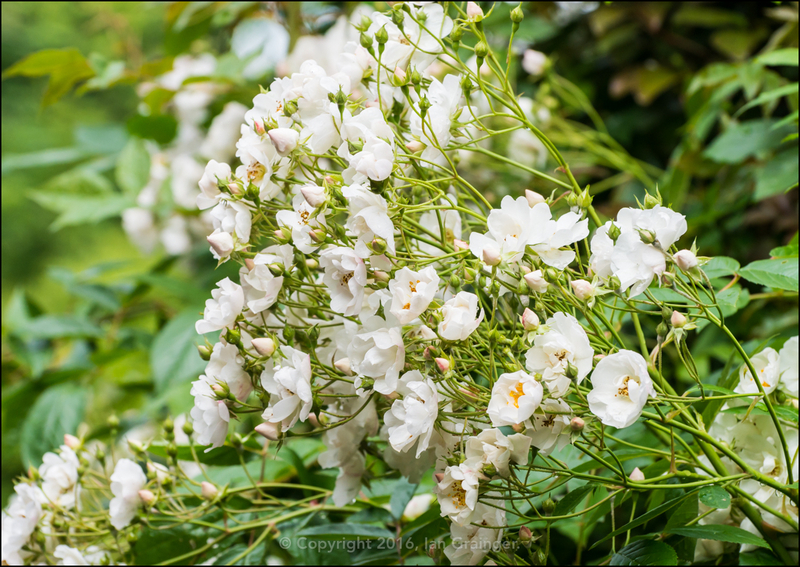 As you can see, it has masses of flowers, and it's another one that the bees, especially, absolutely love. 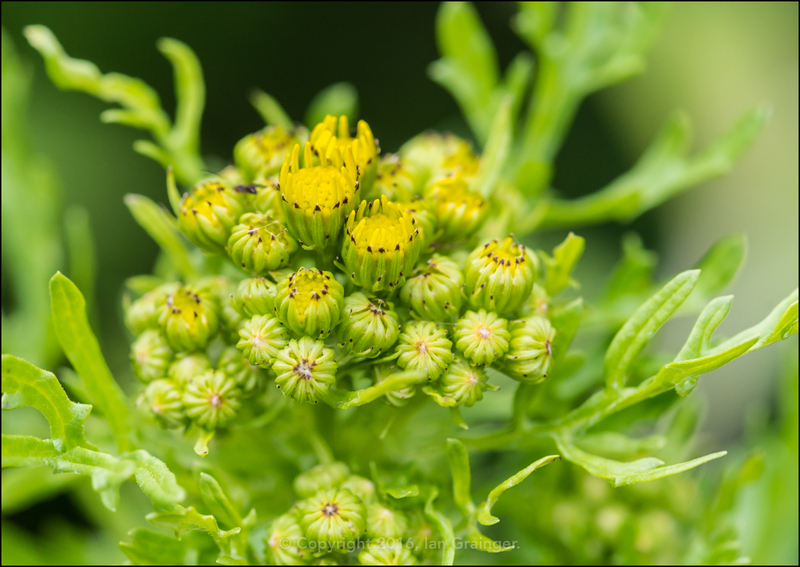 These are Ragwort (Senecio) flower buds, and again, while I wouldn't recommend growing it in your garden, I leave a couple of plants because the hoverflies love the stuff. 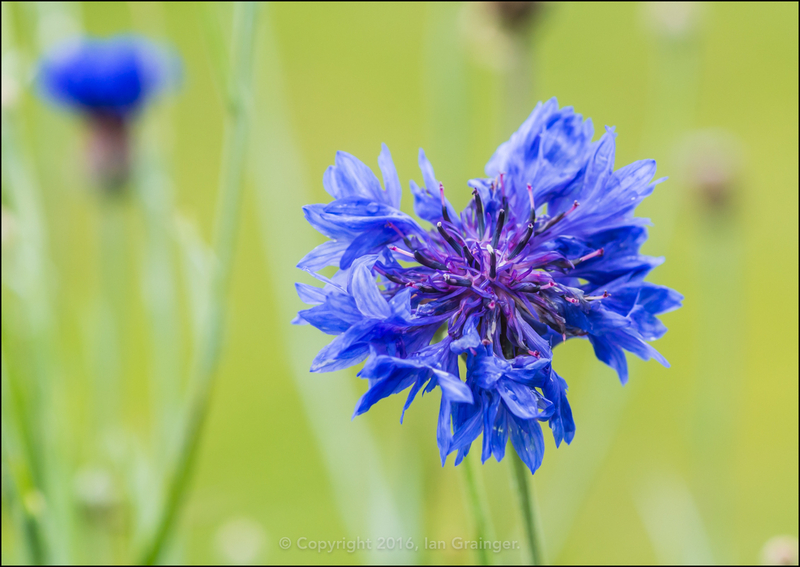 Just remember to cut down before it goes to seed, or you'll end up with thousands of plants! 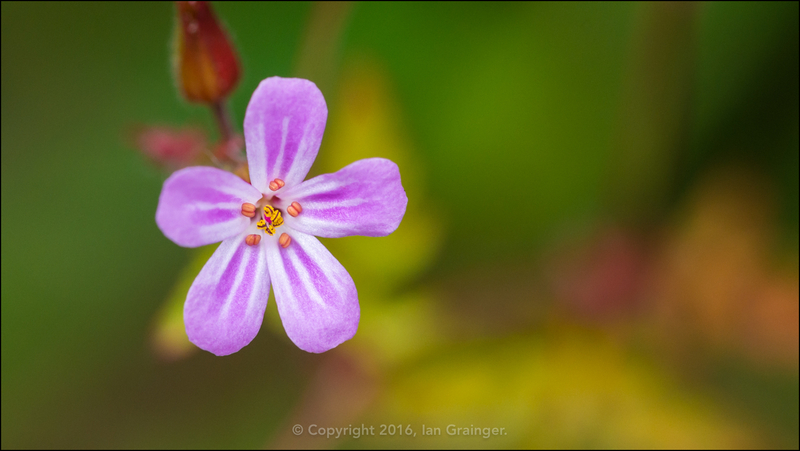 The Herb Robert (Geranium robertianum) is still looking particularly pretty, although because this is growing in between patio stones, I think its days may be numbered. 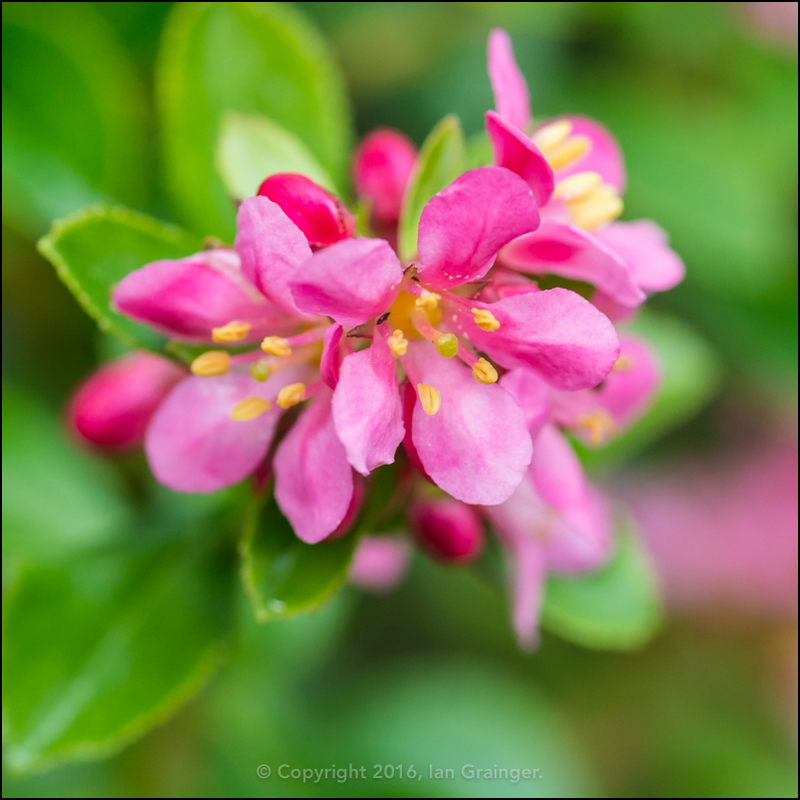 The Escallionia is also beginning to be covered in its beautiful pink blossom. I had to dig one out of my own garden earlier this year as it had died, but am quite keen to grab some cuttings from this one for next year. 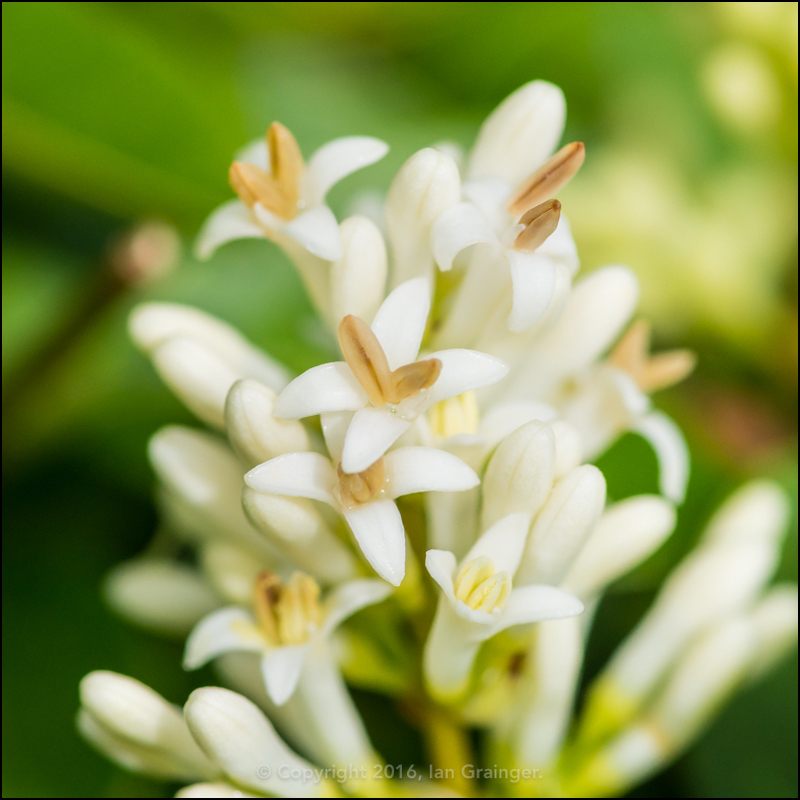 ...and on the way back realised that the Privet hedge was in bloom with these lovely little white flowers. 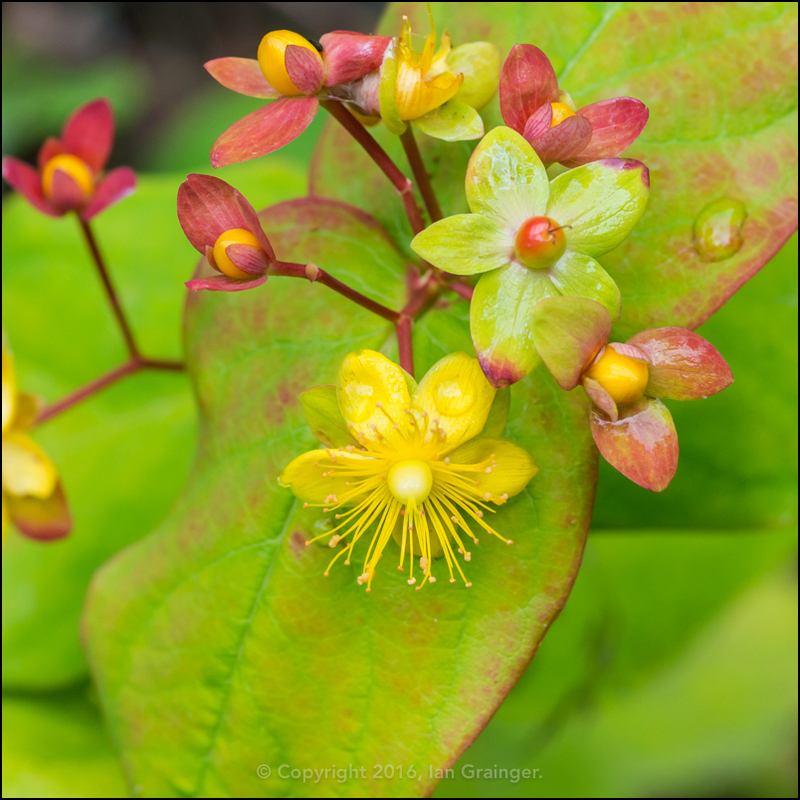 The Tutsan (Hypericum androsaemum) bush seedling that I posted about last week has started to flower also, although because it spreads so rapidly, it will probably be removed before it sets seed. 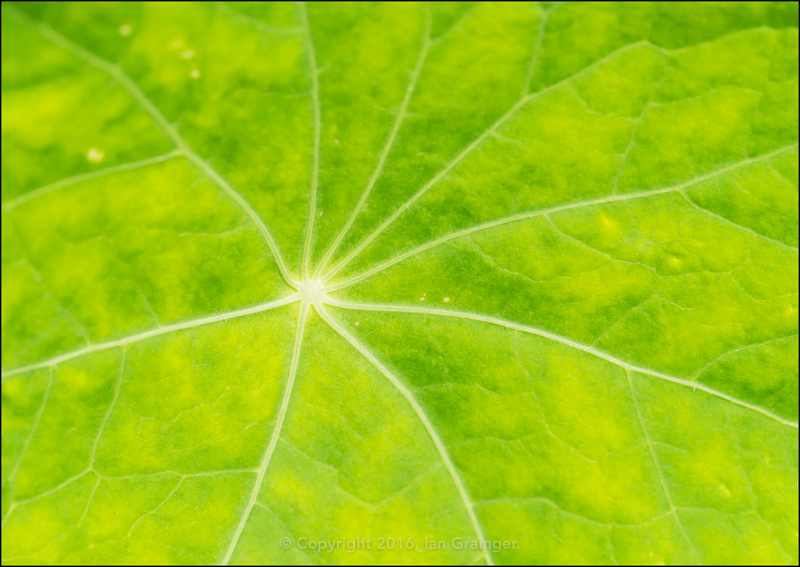 The Nasturtium plants that self seeded last year are finally making an appearance, and their leaves make for a nice abstract image. 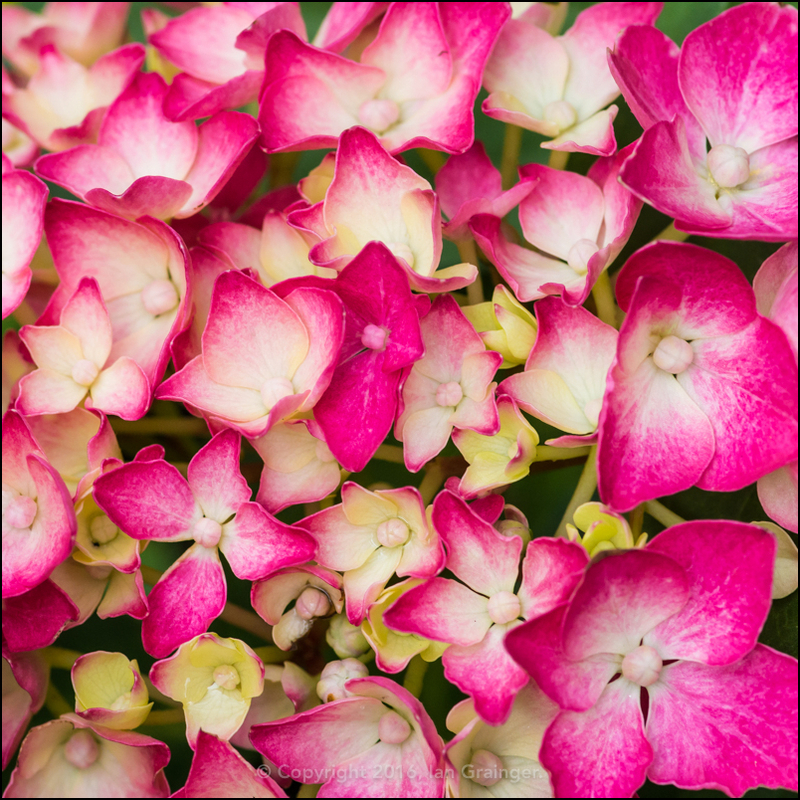 It never seems like summer to me until the Hydrangeas have started to get a bit of colour to their bracts. At least they're one plant that have enjoyed the recent wet weather. 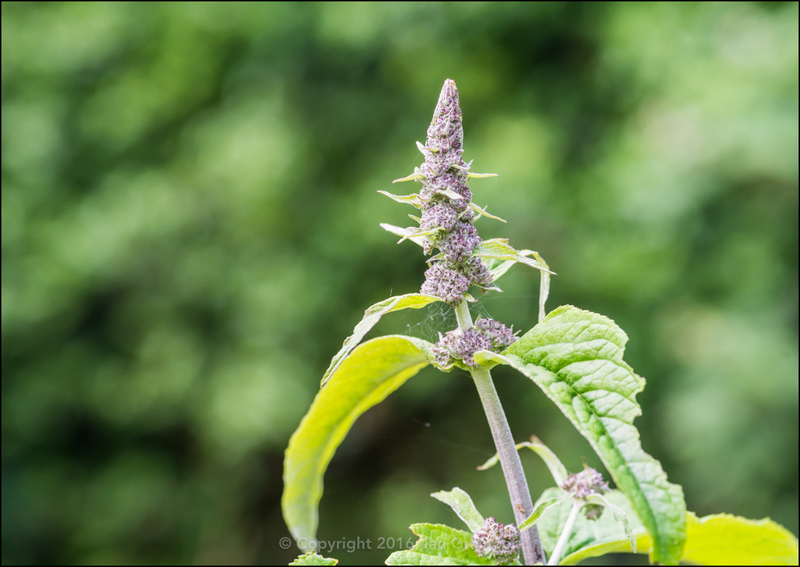 Another shrub that it wouldn't be summertime without is the Butterfly Bush (Buddleia). 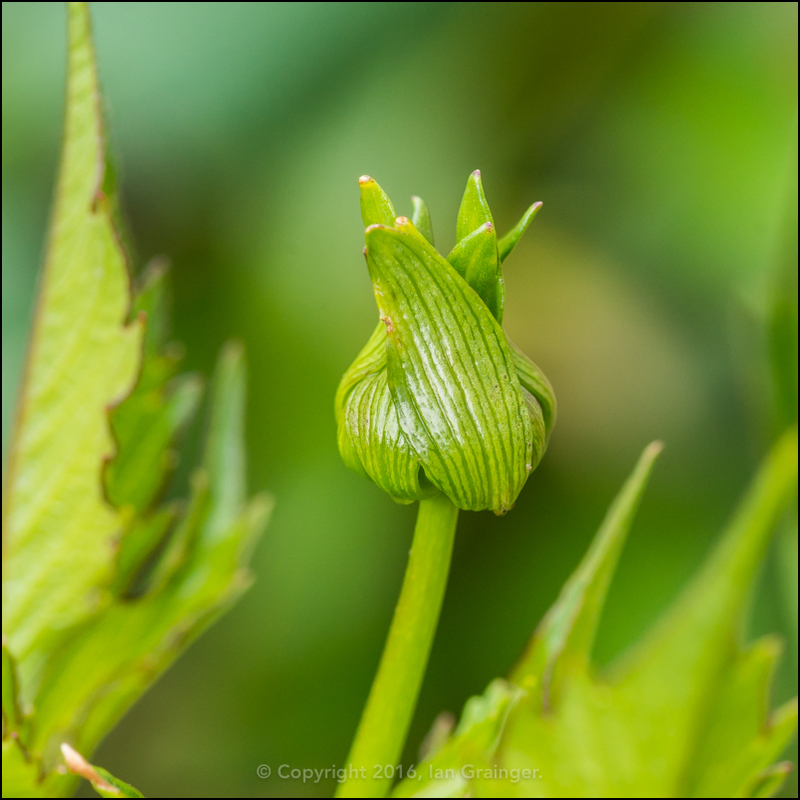 This one is just coming into bud, so it won't be long before it's covered in blooms. Meanwhile back in my own garden, the Dahlias are doing particularly well, with all of my plants producing lots of budding flower stems. 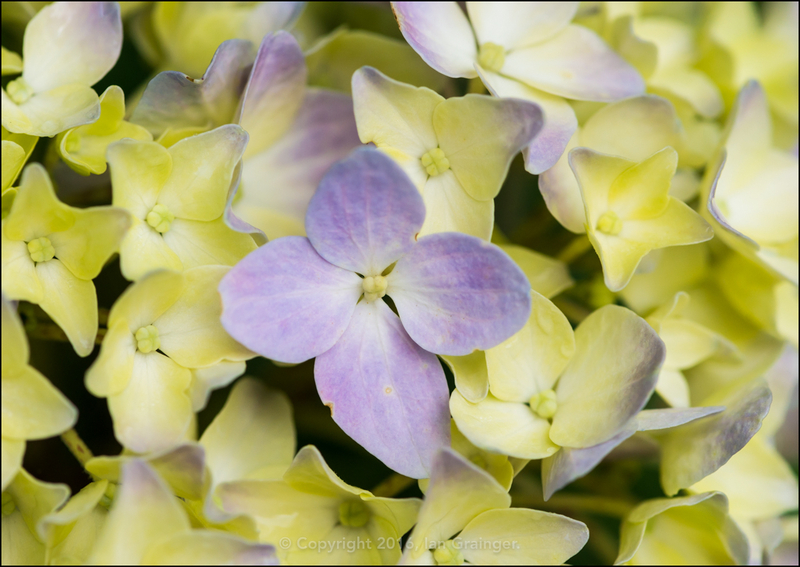 My Hydrangea is also bursting into colour, but could do with some sunshine to bring it along a little faster. 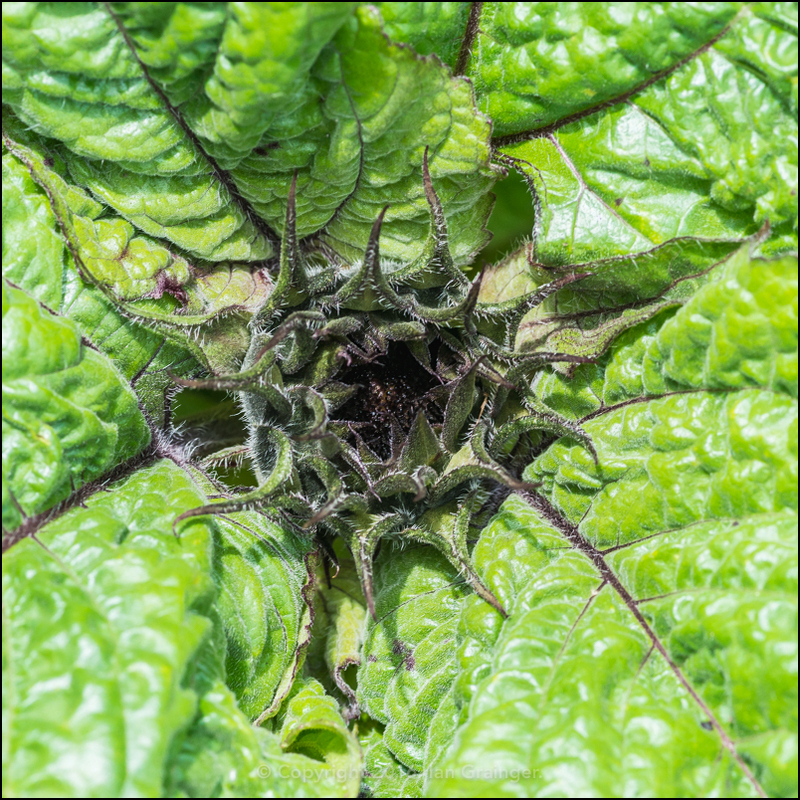 Something else that could do with some sunshine are my Sunflowers. Another few weeks and they should be ready to open. Watch this space! 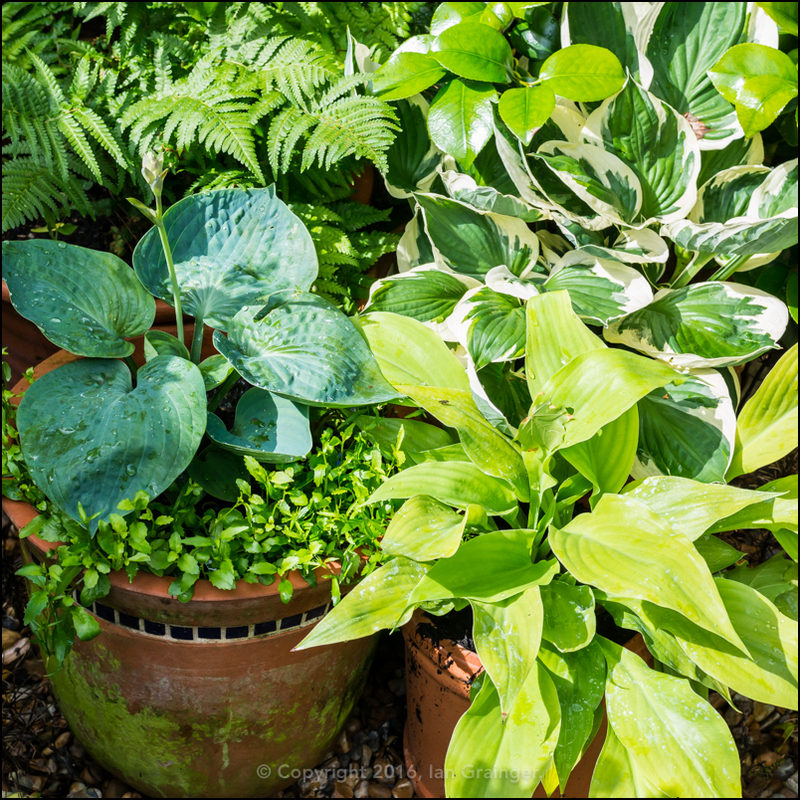 My shady corner is doing well this year, with the Hostas and the Bracken loving the damp, dark conditions. 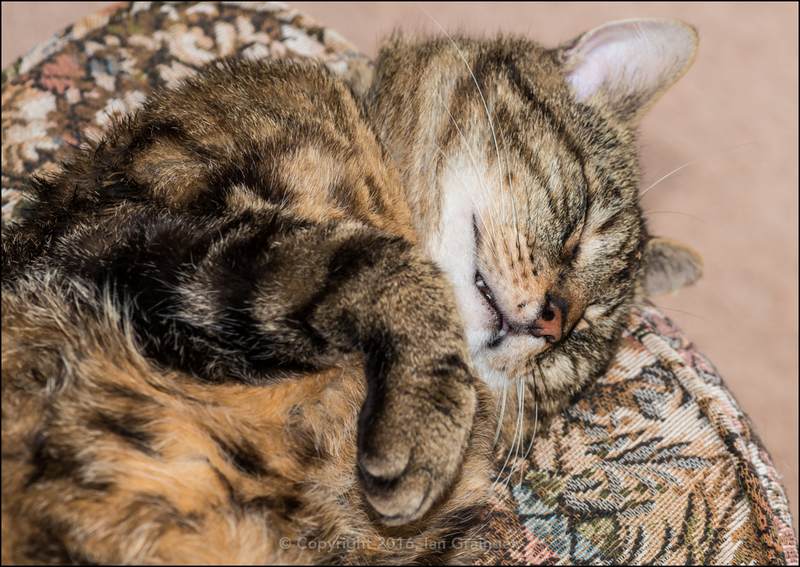 Finally, it's back to my photo companion, worn out with all of his wanderings.